I began my career as a forest ecologist interested in how fire can structure forest communities. Given the opportunity to work for NOAA Fisheries in support of salmon recovery planning in California, my curiosity migrated to the rivers in which salmon swim and along which I love to hike and canoe. I returned to Oregon to work for a non-profit, Ecotrust, that explores and promotes ways to sustainably use natural resources, fisheries and forests. My current research ties together these various threads of my career. I am focused on how plant species can alter the physical form of a river and how the physical dynamics of a river can structure plant communities. I pursue integrative research and work in collaborative frameworks that allow what is learned to be put into practice for the purpose of river restoration and salmon conservation. “Reciprocal plant-river interactions”? “Biogeomorphic succession”? While the practical motivation for my research is rooted in river restoration efforts, the conceptual framework is inspired by concepts that are a mouthful to say. What do these mean? Historically, fluvial geomorphology focused on physical river processes. 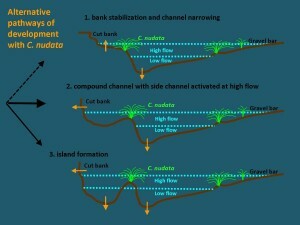 Increasingly, however, biological actors were recognized as having a significant role: for instance, vegetation may reduce erosion and stabilize banks. 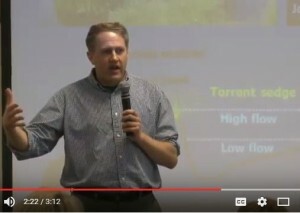 And physical processes such as floods were recognized as shaping riparian plant communities. Nevertheless, research typically framed these effects as unidirectional. In a seminal paper, Corenblit et al. (2007) argued that plant-river interactions should be framed as reciprocal, both constantly influencing the other. They proposed the framework of biogeomorphic succession, the idea that a river and its plant communities are evolving together through different stages of development, each adjusting to the other in a dynamic, connected dance. Carex nudata (torrent sedge) in the Middle Fork John Day River provides a remarkable opportunity to explore these interactions, a natural experiment. After cattle grazing along river banks was eliminated in the 1990s, C. nudata, a suppressed native species, exploded across the river landscape to become the dominant stream-side plant. 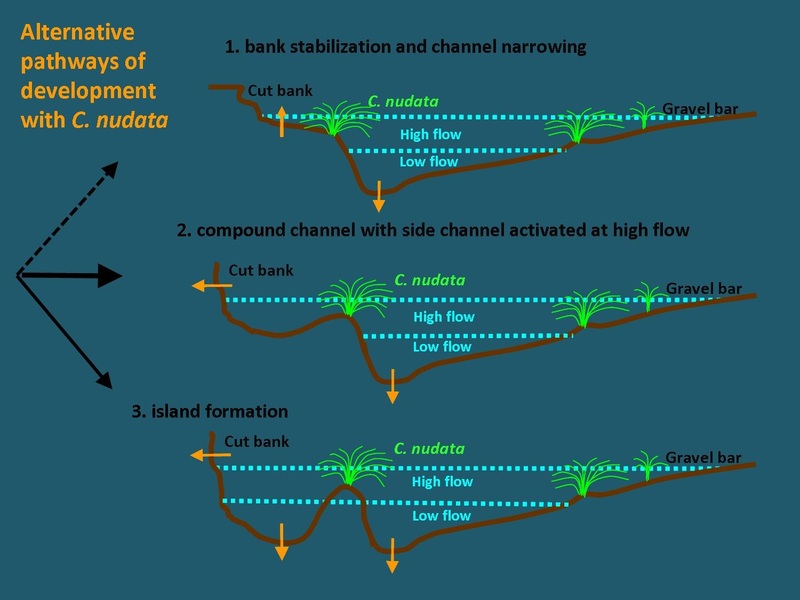 I am investigating how C. nudata is affecting flow patterns, bank erosion rates, streambed erosion/deposition patterns and island genesis. I have also pursued seed planting experiments and establishment surveys. Putting these pieces together, I am building a conceptual model of how the river is changing in conjunction with this plant species and their developmental pathways together.